Yummy, Low Calorie Diet Food -- Plus Where to Buy! : Black is the New Black (for Food)? Black is the New Black (for Food)? (1) The article mentions a great rule of thumb that I am going to use going forward-- that the darker your food naturally is, the more healthy it probably is! 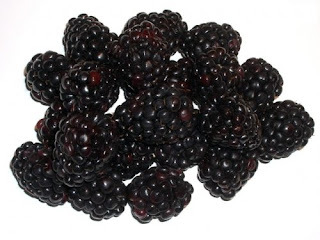 (2) The pigment (called anthocyanin) that makes foods dark is full of antioxidants that protect our bodies from things we don't like such as aging, heart disease, neurological disease, diabetes, cancer, etc. (3) Finding dark foods is easier than you might think. Dark foods include black teas (that usually don't get as much attention as green teas), blueberries (I love frozen blueberries), blackberries, plums, black rice, black beans, acai, red wine, darker breads, darker lettuce (like spinach), eggplant, and of course my all time favorite dark chocolate. There are a lot of great great things you can do to integrate dark colored foods into your diet, from making smoothies, to eating freeze dried fruit, to eating fruit salad (which make a great meal when combined with fage yogurt or other yogurts), to picking dark colored beans, vegetables, spinach or beets to put on your salad at the salad bar. You can also commit to eating one small piece of dark chocolate (the Trader Joe's chocolate wedges nutritional info is in this post) per day. I am going to begin to try to integrate at least two servings of dark foods into my diet every day, and will watch for some yummy dark food recipes to blog about in the future! By the way, a while ago I wrote this post about an article I read about the "11 best foods you aren't eating", that you might be interested in checking out as well. I think the trick is to eat foods from all sorts of color ranges - pitch black blackberries, golden yellow peppers, dark red cherries, and so on. Variety is the key.